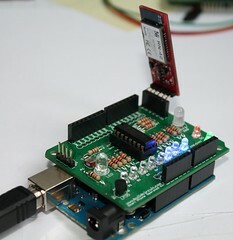 This experiment makes the use of ‘Android- Arduino BTCOMM Shield’ and Amarino. If you are not familiar with the shield, visit this page. This experiment is similar to my previous tutorials Sensor Graph basic experiment and Sensor graph and LED controller together. If you have never worked with Amarino, I strongly recommend you to visit Amarino page and understand the basics of Amarino. In this experiment, the sensor signal from LDR is fed to A1. You can also see A1 clearly on PCB. If you are interested in CD4094 experiments, follow this link. NOTE: The Arduino Sketch has its baud rate set at 9600 bits/s. 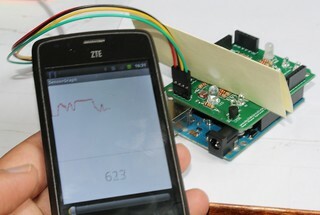 Therefore, your Bluetooth module should also have the same baud rate. Generally, the default baud rate of BlueSMiRF and general bluetooth adaptors is 9600 bps. However, if you want to change baud rate of BlueSMiRF module, follow this link. I have tested this experiment with both 57600 bps and 9600 bps and it works perfectly well. I don’t know if we can change baud rate of general ebay Bluetooth adaptors. The shields version 1.0 and 2.0 have spaces for two different Bluetooth Adapters. Check if you have these adapters. Even if you don’t have these adapters, you can use any other by fixing on breadboard and connecting with extra cable. If you buy Amarino shield version 3.0, there are headers for 3 different bluetooth adapters. 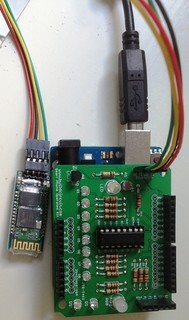 e. Stack your shield and Bluetooth adaptor over Arduino. Below you can see the connections for BlueSMiRF Mate Silver and general adapter. g. Connect to the Bluetooth adapter from your phone and operate the LED and see the LDR sensor’s response on the Amarino interface.